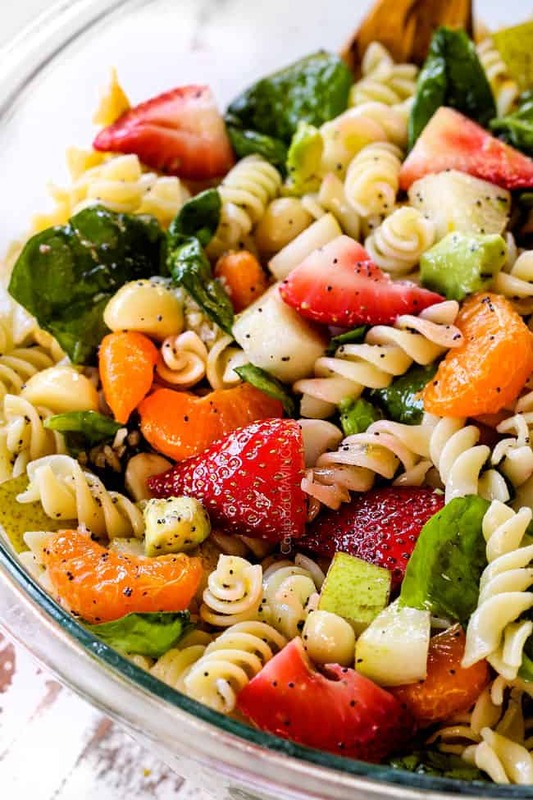 Greek Pasta Salad + the best Greek dressing = the best Greek Pasta Salad of our life! This Greek Pasta Salad is always a crowd pleaser for holidays, potlucks and parties or a delicious grab and go lunch or snack! You can make it 100% ahead of time for stress free entertaining-or snacking. It’s loaded with tender pasta, juicy tomatoes, crunchy bell peppers, crisp cucumbers, punchy red onions, creamy feta and tangy olives all smothered in Sun-Dried Tomato Feta Pesto. This will be the BEST Greek pasta salad you ever make – OR taste! 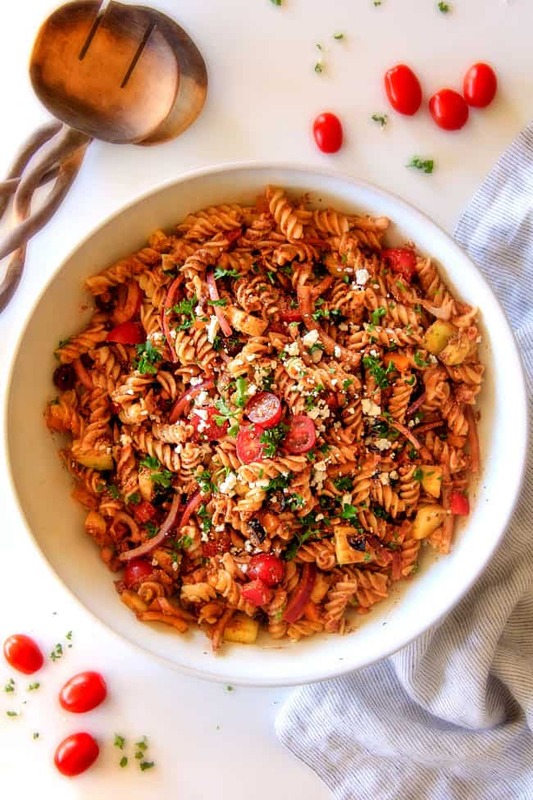 With the official advent of Spring and warm weather upon us, it’s time for fresh and flavorful, guilt free food, in which Greek food inherently fits from chicken souvlaki to farro salad, to this Greek Pasta Salad! This Greek Pasta Salad is fresh, yet satisfying with layer upon layer of fabulous flavor. 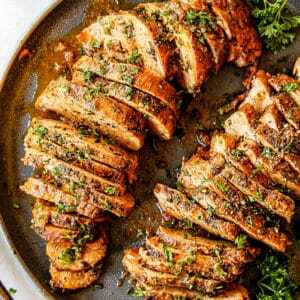 You can serve it as a side or add some grilled chicken and serve it as a main course. The medley of veggies in this Greek Pasta Salad recipes is traditional but the Sun-Dried Tomato Feta Pesto sets this pasta salad way above the rest. Its tangy layers of flavor are seriously so delicious you will wonder how you lived with just classic Greek Pasta Salad all your life. But live deprived no more. Taste even better the next day, or the next day . . .
It’s enveloped in Sun-dried Tomato Greek Dressing! While we do not need to understand the writings of the great Greek philosophers Socrates, Plato, and Aristotle to enjoy this Greek Pasta Salad and other Mediterranean cuisine, it always fun to understand their culture. One ancient Greek pasta dish is called laganum and is very similar to Lasagna, which you know I love! 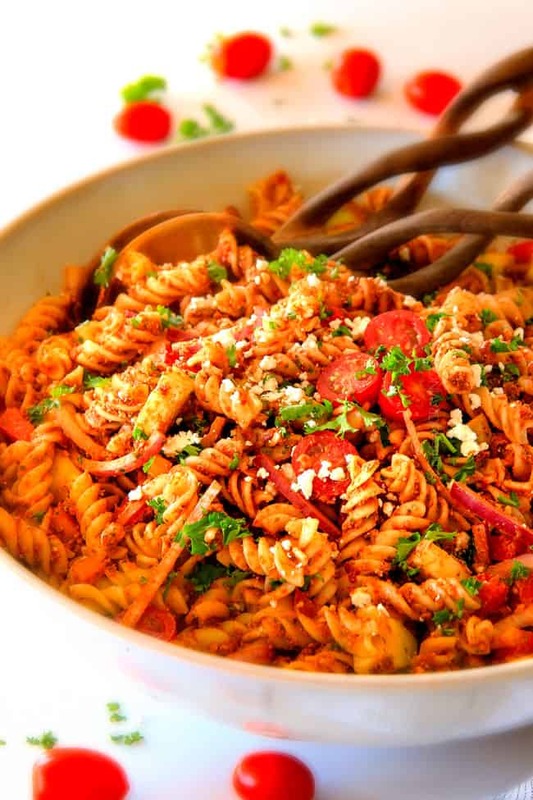 Pasta has always been a staple in the Greek diet. Historians speculate that Marco Polo brought it to Italy from his explorations in China. That is now being argued that the pasta was brought from Greece and not China. The Greek people have been doing pasta longer than the Italians have! In addition, the word for macaroni most likely has Greek origins, and closely resembles makaria, an ancient Greek funerary dish. 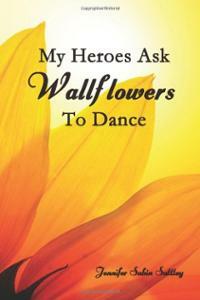 To go along with all the Greek myths wheat-based foods (Pasta!) were highly symbolic of rebirth and regeneration. These honored dishes were used in an effort to honor the dead. Before the Grecian people had refrigerators, pasta was a great solution. They would prepare it, dry it out at the end of summer, and be able to use it thru the year. Many Greek dishes included eggs, which would be preserved with the spices and sauces. 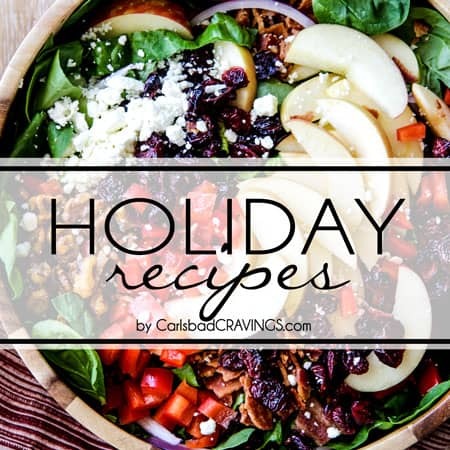 These simple dishes were easy to make for large gatherings and were hearty enough for the hard working people which is why these dishes have passed the test of time. Greek Pasta Salad was born out of the necessity of their situations for easy, sustaining nutrients without refrigeration. I am more than happy to reap these rewards for flavorful easy dishes like my own Greek Pasta Salad recipe! Tomatoes: Please use ripe cherry tomatoes for the best texture. Don’t substitute with other kinds because they will fall apart in the salad. Bell peppers: I use red and yellow for variety of flavor and texture but you may use any color combination. Red onions: I prefer thinly sliced red onion but you may chop it if you prefer. If you’re not a fan of raw onions, you can cook them 30 seconds or so in the microwave to soften the bite or use less. Olives: I use whole olives and then chop them because they are juicer and tend to hold together better but you can use canned sliced olives if you prefer. Cook pasta according to package directions. Drain, rinse with cool water and toss with 2 tablespoons olive oil in a large bowl to keep pasta from sticking together. While the pasta is cooking, make the Greek Dressing and chop your cucumbers, tomatoes, bell peppers, red onions and olives. Add Sun-Dried Tomato Feta Pesto to pasta and toss until evenly coated. Cover and refrigerate at least 2 hours before serving, best if overnight. That’s it for the best Greek Pasta Salad of your life! A traditional Greek salad dressing is really a Greek vinaigrette. 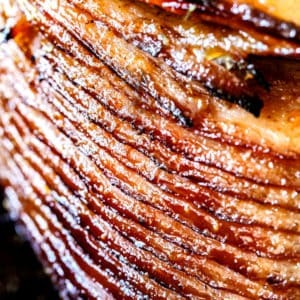 The main ingredients are olive oil, red wine vinegar, lemon juice, Dijon mustard, minced garlic cloves, dried oregano (the key ingredient) and salt and pepper. Onion can be added to the dressing or strait into the dish. Greek Salad Dressing closely resembles Italian dressing. The differences are mostly in sweetness and spices. The Italians add sugar (sugar, honey, or corn syrup) and include fennel, and dill. How to Make the Best Greek salad Dressing? 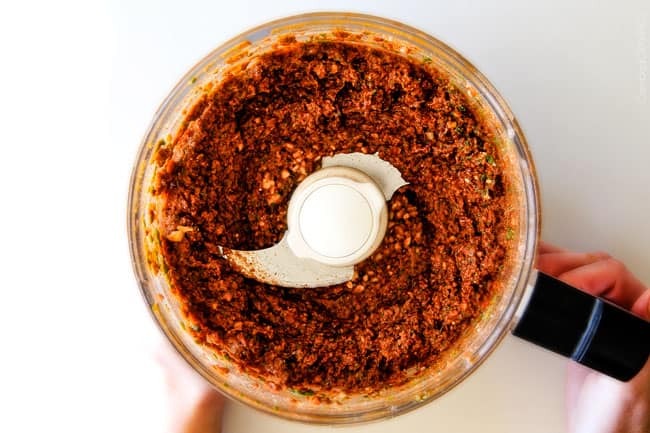 While traditional Greek Dressing is delicious, I’m thoroughly convinced this Sun-Dried Tomato Pesto Dressing is one of the best things on the planet. I’ve combined many of the aforementioned Greek Dressing flavorings such as red wine vinegar, lemon, juice and oregano with sun-dried tomatoes, basil, almonds and feta. The resulting Greek Dressing will knock your socks off! To make the sublime Sun-Dried Tomato Greek Dressing, its a quick pulsing of a jar of sun-dried tomatoes in oil, fresh basil, almonds, feta, garlic, red wine vinegar, lemon juice, oregano, salt, pepper and red pepper flakes. After you make the Greek Dressing – your salad is almost done! Simply add the dressing to the pasta salad and give it a good stir. Once it’s evenly coated, refrigerate for at least two hours. It is important to not overcook your pasta – you want it al dente which means it has a little bite otherwise it will fall apart when tossed. After pasta is drained, immediately add it to a large bowl then toss it with half of the dressing. By tossing it with dressing while it’s still slightly warm, it soaks in even more zesty flavor and the dressing also keeps the pasta from sticking together. If you can get your hands on flavored, chunked feta, it is fabulous! Pasta Substitute. I like to use Rigatoni in this Greek Pasta Salad recipe but any medium or small pasta will work great. Mini farfalle as well as macaroni would work great. One fun change is to add a tortellini filled with cheese or other complimentary ingredients like I do in my Italian Pasta Salad. Customize Dressing. You can choose to make your dressing tangier by additional vinegar or sweeter by the addition of brown sugar. You can make it spicier by adding hot sauce to taste. You may also use store bought dressing if you are in a time or ingredient crunch. Customize Veggies. Feel free to add/substitute any other veggies your heart desires like avocado, artichoke hearts or zucchini! Customize Cheese. If you are not feeling the feta cheese, you can easily use Parmesan, mozzarella balls or skip the cheese all together. Crumbled Goat cheese is another great alternative to feta. Customize Meats. Salami, ham, bacon even hard boiled eggs can be added cubed or in slices. Customize Olives. Change out the type of olive if Kalamata is not your thing. HOW LONG IS GREEK PASTA SALAD GOOD FOR? Cover leftover Greek Pasta Salad with plastic wrap or transfer it to an airtight container. Store in the refrigerator for up to five days. 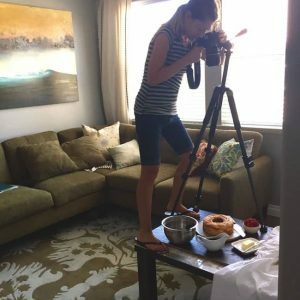 I think it actually tastes best days after you make it! Can you Make Greek Salad Ahead of Time? Yes, please do! Greek Pasta Salad tastes better the next as the delectable Sun-Dried Tomato Feta Pesto infuses every pasta/veggie cell with its serious mouthwatering deliciousness. The fact that this Greek Pasta Salad tastes even better after being stashed in the refrigerator is a huge prep ahead advantage. 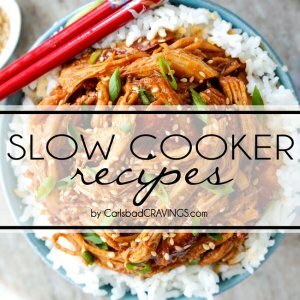 It tastes great for days, which means you can make it days ahead of time! 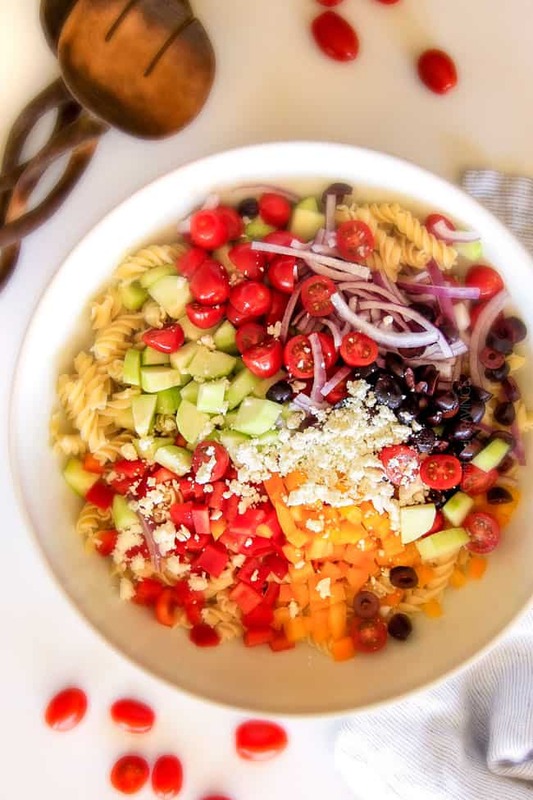 When making Greek Pasta Salad in advance, gently toss all the ingredients together with half of the dressing, cover and refrigerate. When you are ready to serve, toss with desired amount of remaining dressing. You may need to add additional olive oil to loosen up the salad. If you use all of the Greek dressing initially your pasta may soak up all the dressing. You can make the base of the salad, and have different guest or family members add certain toppings. I recommend only leaving out the controversial toppings not everyone loves as these toppings with not have been bathed and marinated in the wonderful dressing. Or toss them in dressing on the side as well. What goes well with pasta salad? Meats/Protein: I love a great BBQ with sliced watermelon and a juicy hamburger. Some Souvlaki or other grilled meats and this Greek Pasta Salad are a perfect Grecian meal the Gods would love. Try these Greek Meat dishes- Greek Chicken, Greek Chicken Salad, and Chicken Souvlaki. Soups: Cold salad + cold soup = perfection on a hot summer day. A very refreshing meal that does not melt you in the kitchen preparing it. 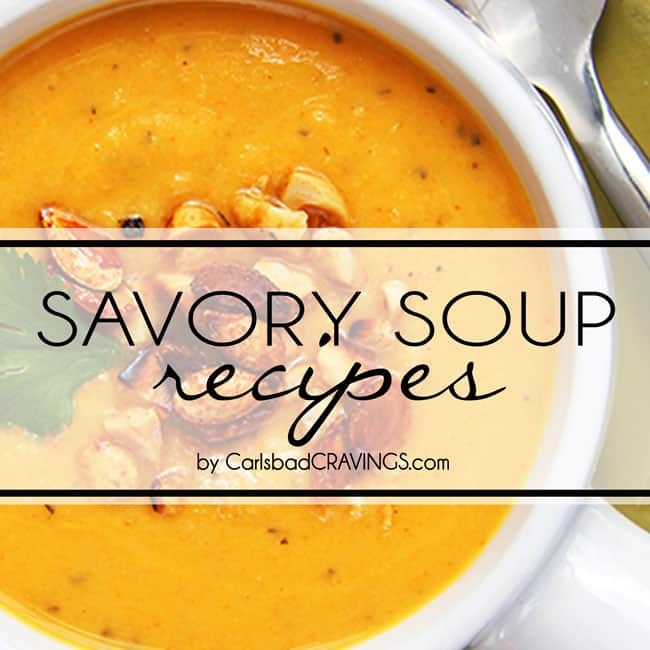 If it’s a spring day, then you can pair it warm soups such as Tomato Basil Soup. Sandwiches/Paninis: Tomato basil caprice sandwich, grilled panini, BLT’s all are great options to accompany Greek Pasta Salad. Vegetables: With how easy Greek Pasta Salad is to make, you will have some time to make a fun vegetable side. Try grilling corn, asparagus, okra or zucchini. 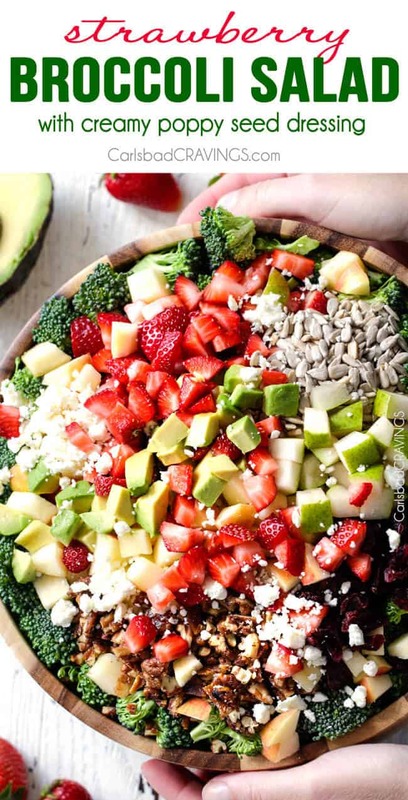 Fruit: simple as fruit slices or my Perfect Fruit Salad bring more fun flavors to enjoy. Bean/legumes/rice: Pickled bean salad, and hummus or a favorite is my Greek Lemon Rice. Bread: corn bread, pitas, roti because carbs are life. Garnish with additional feta and fresh parsley if desired and you have mouthwatering Greek Pasta Salad with Sun-Dried Tomato Feta Pesto. 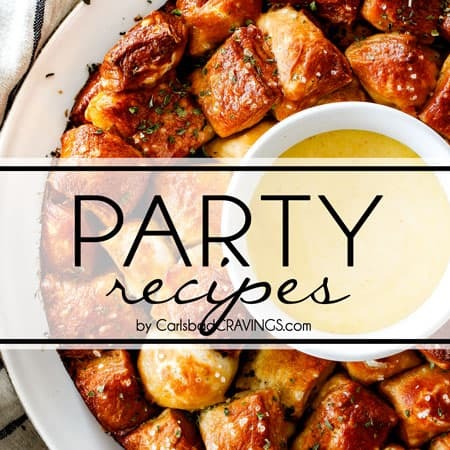 You have the hit at every potluck and party! 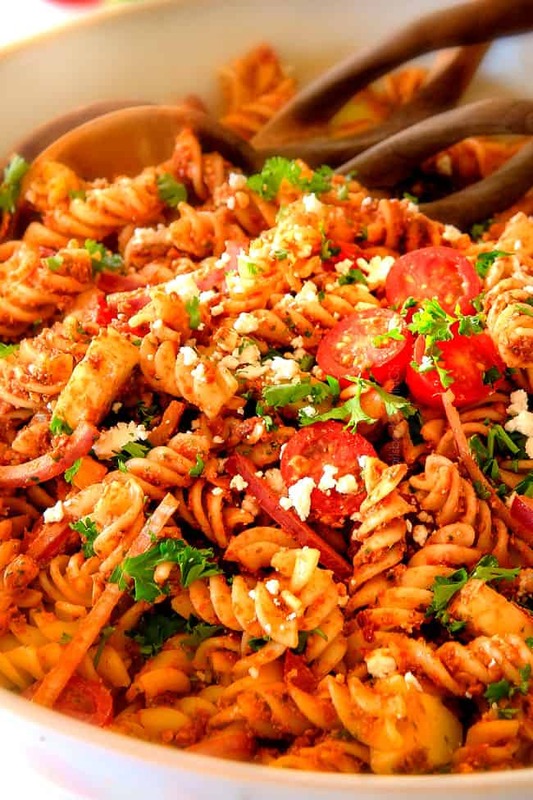 Want to try this Greek Pasta Salad Recipe? 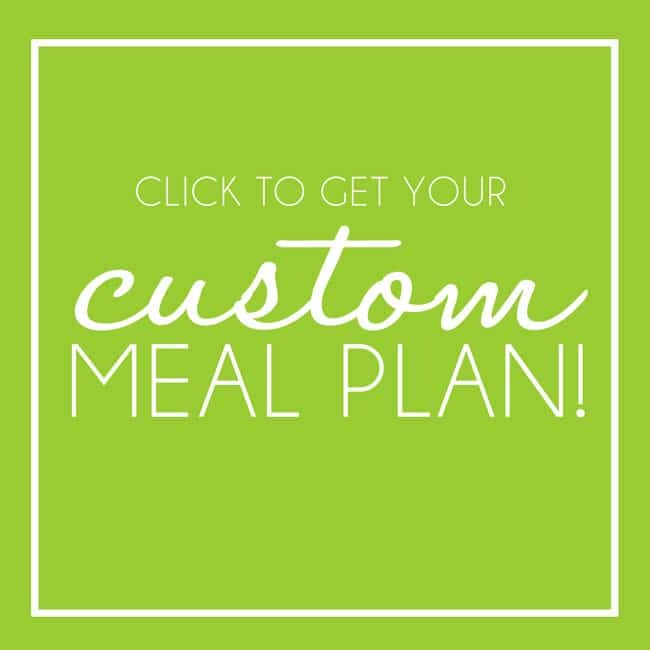 Pin it to your SALAD, PASTA, POTLUCK or HOLIDAY Board to SAVE for later! 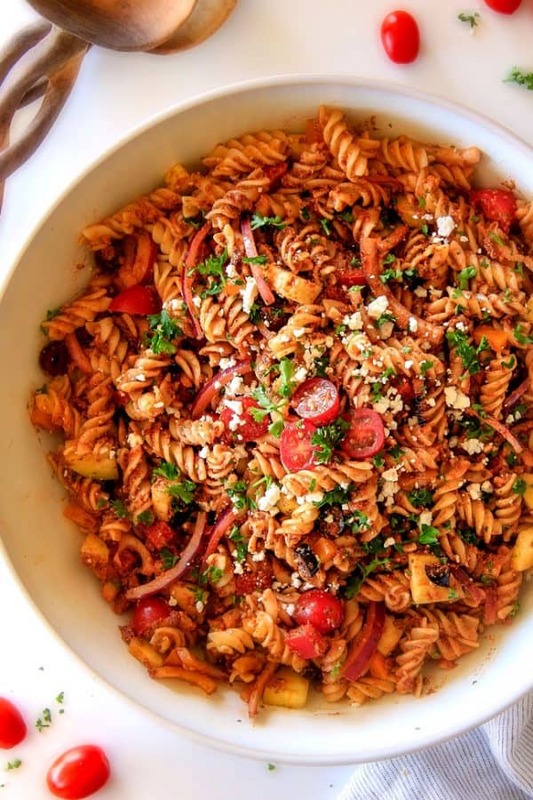 Easy, make ahead, Greek Pasta Salad with Sun-Dried Tomato Feta Pesto will be the BEST Greek pasta salad you ever make! This Greek Pasta Salad is the ideal stress free crowd pleasing side for all your holidays, potlucks and parties or a delicious grab and go lunch or snack! Cook pasta in generously salted water according to package directions. Drain, rinse with cool water and toss with 2 tablespoons olive oil in a large bowl. Add cucumbers, tomatoes, bell peppers, red onions and olives. 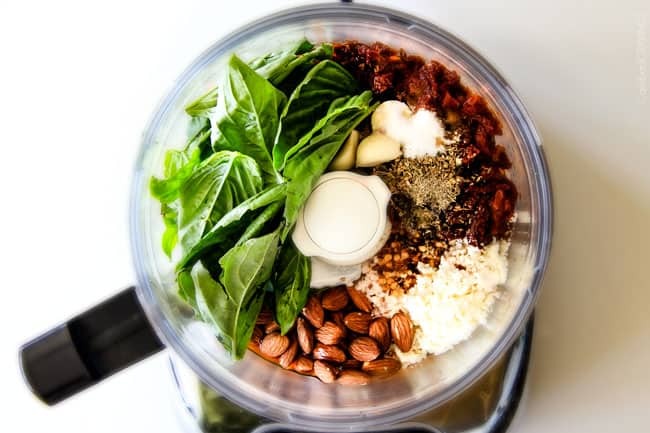 Add all of the Sun-Dried Tomato Feta Pesto ingredients to a food processor and process until finely chopped. Add Sun-Dried Tomato Feta Pesto to pasta and toss until evenly coated. Cover and refrigerate at least 2 hours before serving, best if overnight. Toss salad with additional olive oil, feta and fresh parsley before serving if desired. *As the amount of oil in sun-dried tomato jars can vary, you may want to add additional olive oil to taste if the pasta doesn't seem moist enough before serving. This looks soo good! Can’t wait to try it!! Thanks! You are so welcome! 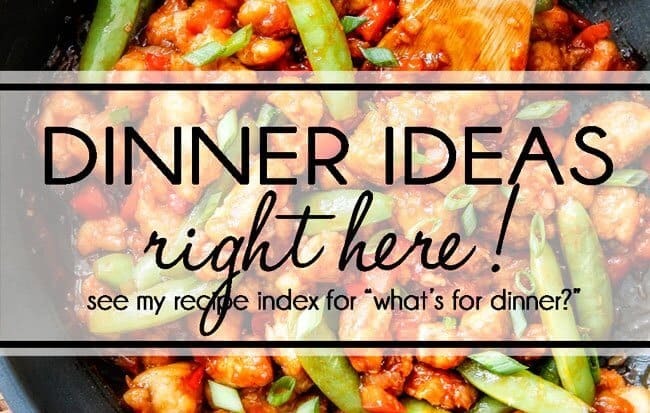 I am excited for you to try it – its definitely a new favorite over here! Thank you Kristine! I made the pasta salad for a party last night and it was a huge hit ! Everyone loved it ! 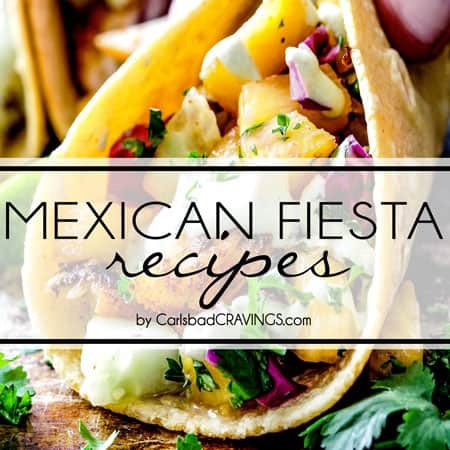 I shared the link to your recipe with all those who asked too ! YAY! 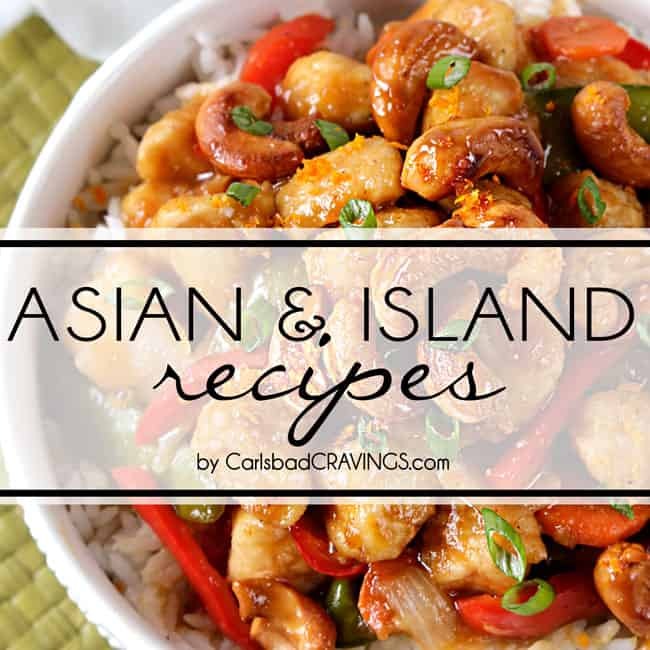 I am so happy this was such a huge hit, thank you so much and thank you for sharing my recipe! I made this pasta salad today with gluten free noodles, and it was so good!! 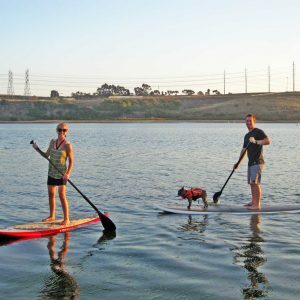 I took it to a Fourth of July party and everyone loved it! I have not tried a recipe of yours that I haven’t loved!! Hi Amanda, I am so sorry at my delayed response as I was in the hospital when I received it and have been so behind ever since but I SO appreciate your comment! 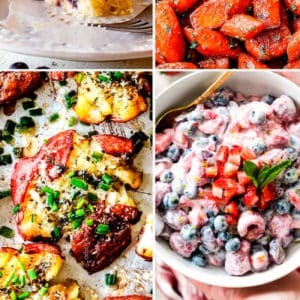 I am thrilled this was such a hit at 4th of July and so flattered you have been enjoying all my recipes – that means so much to me! Thank you! Hi! Can you make this without the almonds? I want ro take to a bbq but one of the kids in our party has a nut allergy. Sorry for the delay Jessica, just got home from an Alaskan cruse and was without internet! Is he allergic to sunflower seeds? I would try unsalted sunflower seeds and if that is not an option then skip them. Enjoy!